Purchased by Dino Manetti in 1968, the Fontodi estate contains vineyards that have been in production since the time of the Roman Empire. It is located in the heart of Chianti Classico in the Conca d’Oro, or “Golden Shell”, a valley directly south of the town of Panzano. This remarkable amphitheatre-shaped landscape combines a high-altitude location with calcareous clay-schist soil and a truly remarkable micro-climate; generally, it is warm and dry with a marked difference between day and night-time temperatures. In 1979, Giovanni Manetti, Dino’s young son, joined the family business. Esteemed winemaker Franco Barnabei was hired as a consultant. Together they have transformed Fontodi, modifying and improving the estate and the portfolio of wines, some of Tuscany’s best. 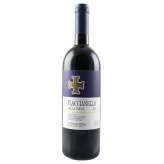 Fontodi is a Certified Organic estate that extends over 130 hectares. Only 70 acres are planted to vines. Giovanni is a fierce proponent of the integrity of the Sangiovese grape, earnestly increasing the proportion of Sangiovese to Cabernet Sauvignon in his wines as his vines age. Since 1981, his Flaccianello has been made entirely of Sangiovese. The agricultural practices respect nature and are mindful of vineyard sustainability. In this healthy vineyard, grapes produce wines that are better, purer and a more true expression of terroir.